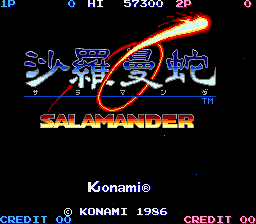 This guide is for the arcade versions of Salamander and Life Force, and similar ports. For the NES conversion of these games, see Life Force. Salamander (沙羅曼蛇, Salamander? 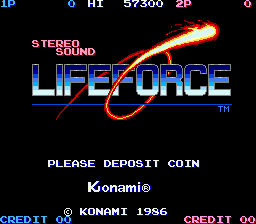 ), retitled Lifeforce in North America and in the Japanese arcade re-release (see version differences), is a scrolling Shooter arcade game by Konami. Released in 1986 as a spin-off to Gradius, Salamander introduced a simplified power-up system, two-player cooperative gameplay and both horizontally and vertically scrolling stages. Some of these would later become the norm for future Gradius games. The first player controls Vic Viper and the second player takes the reins of debuting spacecraft Lord British. Two players can play together simultaneously. The game features six stages which alter between horizontal and vertical scrolling. Players are allowed to continue from where they leave upon death instead of being returned to a predefined checkpoint per Gradius tradition. There are no continues in Salamander's single player mode, however, in the two-player mode, players are given two continues. The number of continues can be changed through DIP switches. Several home conversions of the game were made. The game was simplified substantially for the European 8-bit home computer market, including the Commodore 64, Amstrad CPC, and Sinclair ZX Spectrum. For the NES conversion, elements were taken from the original Salamander and the Japanese Life Force re-release, and some elements, such as levels and bosses, were removed to make way for new content. Near arcade-perfect ports were released for both the PC Engine and the Sharp X68000 home computer. Salamander was followed with an official sequel in 1996 entitled Salamander 2. The story between the different versions of Salamander differs. While the story in the arcade original is not entirely clear, the NES version claims a large creature named Zelos (possibly the serpent often pictured on the game's cover art) is preparing to swallow your planet whole, and you must stop it from the inside out. The US arcade follows primarily the same story. the Japanese LifeForce may have a more surgery-related story, involving the removal of an unwanted virus or microbe from the body. The MSX version differs the most from any of these. Basically, a prophecy from long ago comes true when an army attacks Latis and its surrounding planets. They have created a barrier around Latis, and the only way to undo it is by activating a 'crush blow' system created by ancient Latisians. There were essentially three different releases of this game in the arcade. 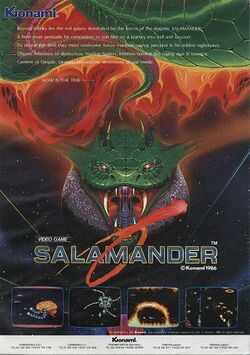 The original version, Salamander, was released in Japan, followed by Europe. It contains nearly all of the power-ups from in Gradius replacing the Double Shot with the Ripple Beam. Unlike Gradius, the power-ups are activated instantly upon collecting them. When it was localized for play overseas, Konami took the organic theme of the first stage and applied it to every stage, replacing the scrolling star background, a traditional hallmark of the Gradius series, with a webbing background to tie the organic theme throughout each level. They renamed this version of the game Lifeforce, and added more voice-overs which introduced each stage. Aside from these changes, the American version of Lifeforce is identical to the original release of Salamander. 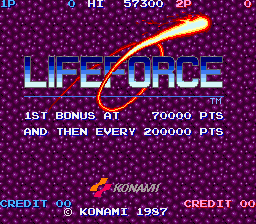 Finally, Konami decided to take the changes made for Lifeforce in North America, expand upon them, and release this new version of the game as Lifeforce in Japan. The organic theme is even more broadly applied, changing the background from webbing to cellular organics. Enemies are also changed from mechanical beings to organic ones. But perhaps the most significant change in this version is the return to the original power-up meter found in Gradius. While player 1 uses the original meter arrangement, the second player uses an alternate arrangement. This page was last edited on 8 July 2015, at 15:21.